Download your technical data reports to build up your shot characteristic averages. The statistics can be reviewed and filtered to create your own golf timeline. MySwingCloud offers you the opportunity to create your own online calendar for free! A player will be able to book a lesson as well as any other event you'll open to the public in your online calendar. 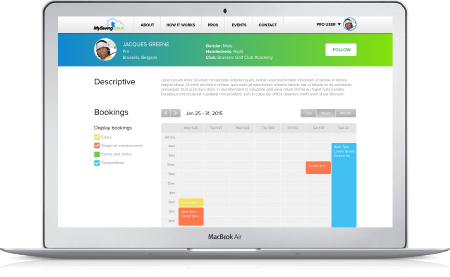 MySwingCloud offers you the opportunity to create live online the profile of your students. MySwingCloud offers you the opportunity to add a video on your student's account at any time. MySwingCloud offers you the opportunity to comment any video of your students as well as if a student asks you for a tip, to coach him online thanks to video and advice exchange.